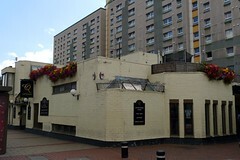 A locals' pub on Queen's Market by Upton Park Station in Upton Park. The building is a squat brick post-war estate building in the front of a large housing estate, adjoining the Queen's Market area just by the station. Inside it's quite spacious, with two distinct areas separated by the bar area jutting out somewhat, and the contours of an internal wall, though there are no doors between the spaces. On Ewan's mid-afternoon Sunday visit in July 2016, most of the drinkers were gathered along the south side of the bar, while a large rectangular room to the north featured table seating around the edge and a pool table in the middle, and was largely empty. TV screens are situated in the corners of both halves of the pub, showing sports (volume levels not too loud, and occasionally punctuated by music, presumably from a jukebox). Undoubtedly the atmosphere is different on a football match day, but it was perfectly pleasant on a Sunday afternoon. At the bar, the beer range is from the Star Pubs and Bars (formerly Scottish & Newcastle) tied range, including Heineken, Amstel and other standard lagers on tap, along with John Smith. Coke came from small bottles rather than a soft drinks gun. No cask ales or handpulls in evidence, nor any food menu. Accessibility: No step to get in as far as I can recall; toilets on the same level. Last visited by Ewan and others, July 2016. Opening hours taken from What Pub. Last edited 2017-12-19 13:32:37 (version 2; diff). List all versions. Page last edited 2017-12-19 13:32:37 (version 2).